Not really good news coming out of Rye Playland, so far this Summer season attendance and revenues are both down again from last year. The park is still being evaluated for possible changes to its future use. Universal Studios Hollywood has announced three big name mazes for this year's Halloween Horror Nights. Alice Cooper Goes to Hell 3-D, Silent Hill (based on the video game), and the Walking Dead (based on the AMC tv show) will scare guests this fall. Still no official word on the projects going on at Universal Studios Florida, but this update gives us some new views of the work. Looks like they're digging downward at the non-Potter site, giving more credibility to the Transformers rumor. 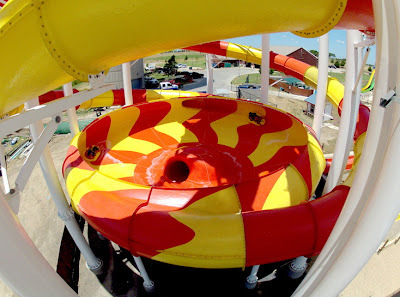 Hawaiian Falls Roanoke, Texas, has opened SplashTacular's new Double BowlsEye slide, which sends two sets of riders down at the same time into the same bowl finale. Looks wild! Check out a video of the slide here. Tomorrow is the last day for everyone to take a spin on Disaster Transport at Cedar Point before the ride closes forever. There's still time to donate to one of the riders who are raising money for Give Kids the World, as of right now an astonishing $16,000 has already been pledged! Also in the great state of Ohio, the Beach Water Park has announced that they will reopen next season as The Beach at Adventure Landing. A new operator will take over, add new slides, kiddie area, and revamp the wave pool. 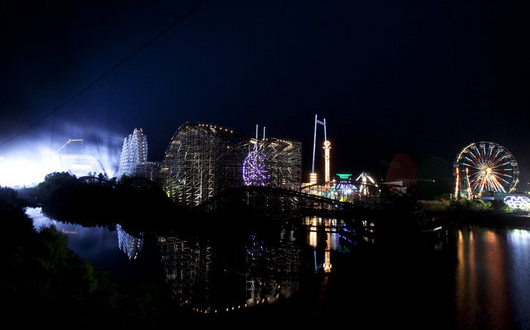 Six Flags New Orleans has momentarily come back to life to be used as a set for Percy Jackson: Sea of Monsters, a new movie due out next Summer. It's weird to see the park look so alive (although creepy still) but know that it's deader than dead. There's a lot of numbers in this story covering Six Flags' 2nd quarter earnings, but what can be taken away is that the company did well, really well, actually, during the period. Looks like the new management is continuing to show how capable they are. I missed this one a while back, but Waldameer Park has announced plans to bring a Musik Express to the park for the 2013 season, and possibly a large family restaurant in 2014.